I've been working on this one for some time now trying to get the Carbon Fiber look just right. Not a lot of animation on this one. I'm working on a set with more animation. I hope you like them! 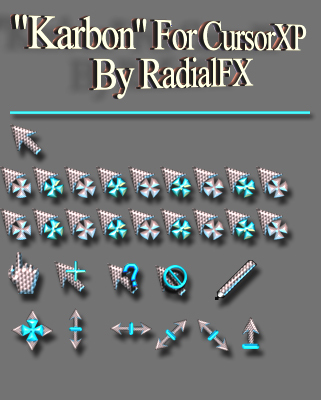 Nice cursor, Radial_FX!! I even like the color. Radial It's about time. I've been waiting, and believe me, it was worth the wait. These cursors are one of the cleanest I have ever seen. GREAT JOB MY FRIEND. Thanks everyone! You guys are great, I'm proud to be in your company. Again....Thank you. Radial, you have outdone yourself. These are the best cursors I have ever seen. You are truly an incredible artist. Thanks Brad43! Thank you very much!